While working for the Barcelona Center for International Health Research, Caterina spent much of her time in Mozambique performing malaria research. She began by performing epidemiological studies and clinical trials of the RTS, S malaria vaccine, which was the most advanced at the time. Caterina then shifted her focus to monitoring, evaluation, and effectiveness studies concerning the malaria burden, specifically in the area of Manhiça in Mozambique. Although Caterina has received her PhD in public health, she felt there was still more she could learn in order to build upon her work. When she heard of the Post-Graduate Fellowship program through her supervisor, she saw an opportunity to continue her research and further her capabilities. Currently, Caterina works closely with Associate Professor Emmanuela Gakidou on the Malaria Control Policy Assessment (MCPA) project in collaboration with the Infectious Diseases Research Collaboration in Uganda and the University of Zambia. 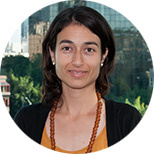 Caterina is very familiar with one goal of MCPA: to evaluate the effectiveness of malaria control interventions and provide decision-makers with the best possible information about malaria control efforts. Her primary responsibility is analysis, and her expertise in this area has been invaluable to furthering the purpose of MCPA. She also works closely with Associate Professor Stephen Lim on the GAVI evaluation project in five different countries.